Jérôme Valcke, Fifa's general secretary, believes the 2018 and 2022 World Cups have gone to the right countries. Photograph: Lucas Dolega/EPA Fifa has no intention of considering reform of the voting system for choosing World Cup hosts despite the controversy which surrounded the awarding of the 2018 and 2022 tournaments, according to the general secretary Jérôme Valcke. "We just voted last Thursday. We have not sat down to discuss a reform of the voting system. It is not part of our discussions," he said. Fifa's executive committee voted to award the next two tournaments to Russia and Qatar, prompting angry complaints, particularly from England, that politics had played too large a part in the process. "Yes, it is a political decision ... but overall I think reactions were positive. The decision was fairly well received by football fans. It shows football is open to the world," Valcke said. "Russia is a great footballing country and deserves it. And the Middle East is part of the family of football." The committee had been cut to 22 members after two were suspended by the ethics committee following an investigation into corruption allegations made by a British newspaper. 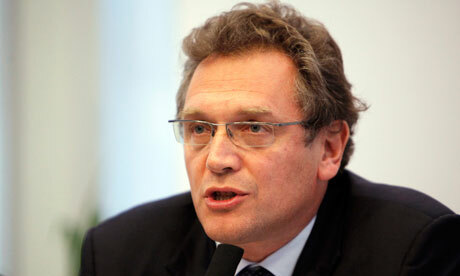 Regarding the voting system, Valcke said: "The 22 members were in a room with a lawyer and an official. Each one got up to vote with a ballot paper which had a stamp from the lawyer. It is normal that the vote be secret. "The matter is closed. We dealt very well with the two who were caught. We reacted well to the situation. The two members were suspended. There is no need to be ashamed." The next bidding process to chose who will stage the 2026 tournament will not take place before 2018.